Having blood sugar level 200-250mg/dl after eating means you have diabetes. These levels of glucose are considered moderately high, and immediate treatment should be taken into consideration. 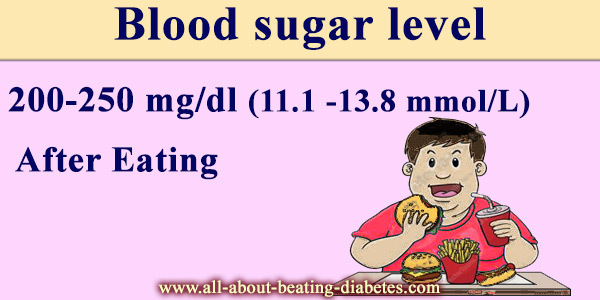 It is quite normal for blood sugar levels to rise after eating. The increased levels of glucose trigger the insulin production and secretion by the pancreas. This is a compensatory mechanism, in order to neutralize the increased glucose. Usually, the release of insulin takes place within 10 minutes after eating. The insulin removes glucose from the bloodstream to the cells where it is used as an energy source. Blood sugar level 200-250 mg/dl (11.1 -13.8 mmol/L after eating - Any Warning Sign? Blood sugar level 200-250 mg/dl (11.1 -13.8 mmol/L after eating - What is the best treatment strategy? Blood sugar level 200-250 mg/dl means you have very unstable glucose level, and this seeks immediate treatment. Your primary therapy will be drug therapy, which may include the use of oral antidiabetics or insulin as your doctor will advise you. But, when diabetic, lifestyle changes do matter a lot. They are a very important part of diabetes treatment. 1. Drink plenty of water - this will help clean your bloodstream from excessive sugar. 2. Think what have you eaten to cause high blood sugar levels? Try to eliminate as much as possible high carbohydrate foods, fat, and foods rich in calories. 3. Physical activity after eating - Not only it decreases your glucose levels, but it also improves blood circulation and decreases fat levels in your bloodstream. These changes delay the long-term complications of diabetes. Try mild exercise (e.g. short walking, shooting hoops, clean up the kitchen, ping-pong) 10 or 15 minutes after eating, this will avoid spikes in blood sugar levels after eating.